The Fourth Frog Blog: Indy, I give you a proud! We have a saying in our house: "I give you a proud." It goes back to Annie's First Communion. My in-laws were in town for the occasion and were getting ready to return home. My mother-in-law said to Annie "You were so pretty and you did such a good job. I'm really proud of you." Then she kissed Charlie and Robbie goodbye and went out the front door. Charlie ran after her, crying, "GoGo! You didn't give me a proud!" Since then when someone does something good, we often say "I give you a proud for that." And today, I'm saying "Indianapolis, I give you a proud for the amazing celebration you've put together for Super Bowl XLVI." 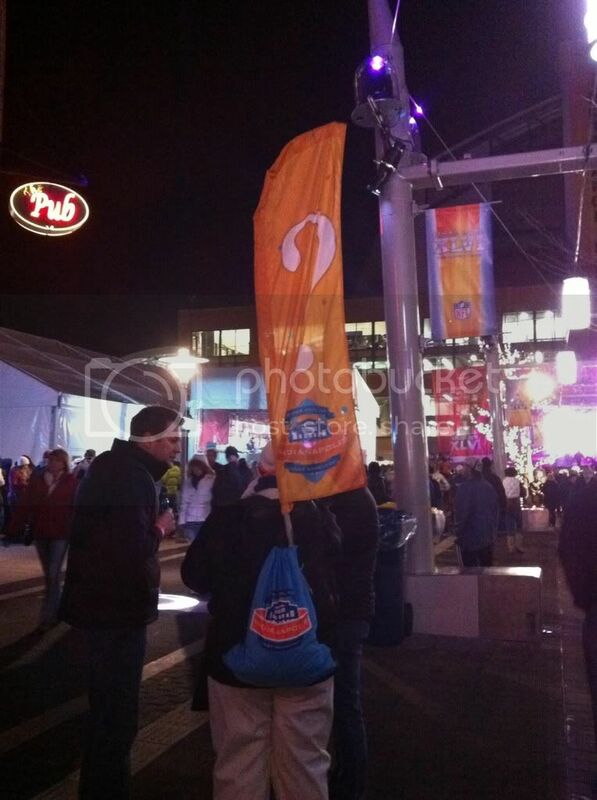 Super Bowl Village opened here on Friday night. I watched posts and pictures pop up on Facebook and so wanted to be part of the party. 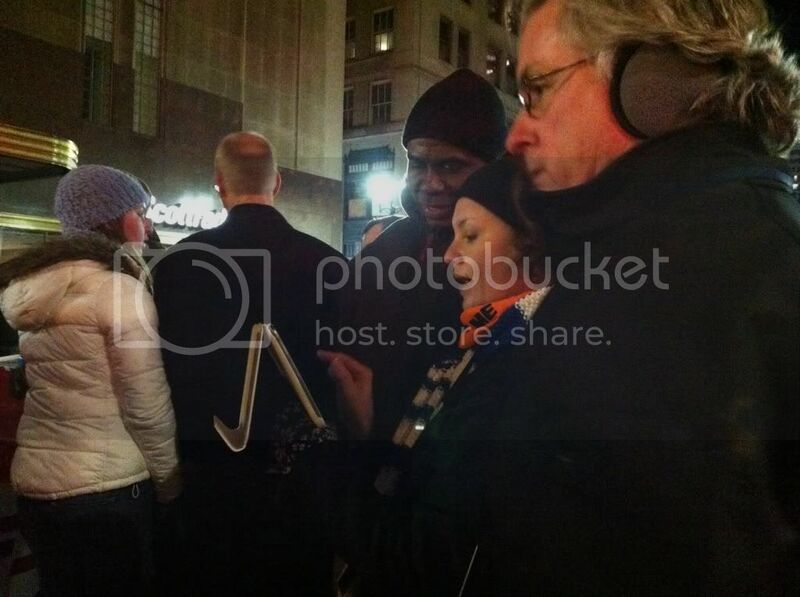 On Saturday night, Annie and I went downtown with friends to soak up the super atmosphere. 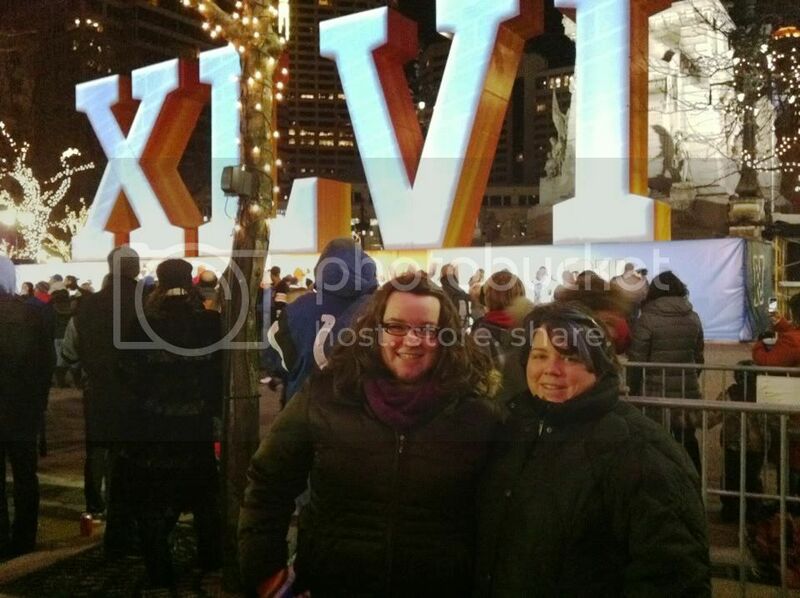 We entered the village on the south side of Monument Circle, where the massive XLVI letters stand. (They were designed by a co-worker's son and installed by a crew led by her husband.) There was music and a light show and a general festive atmosphere. 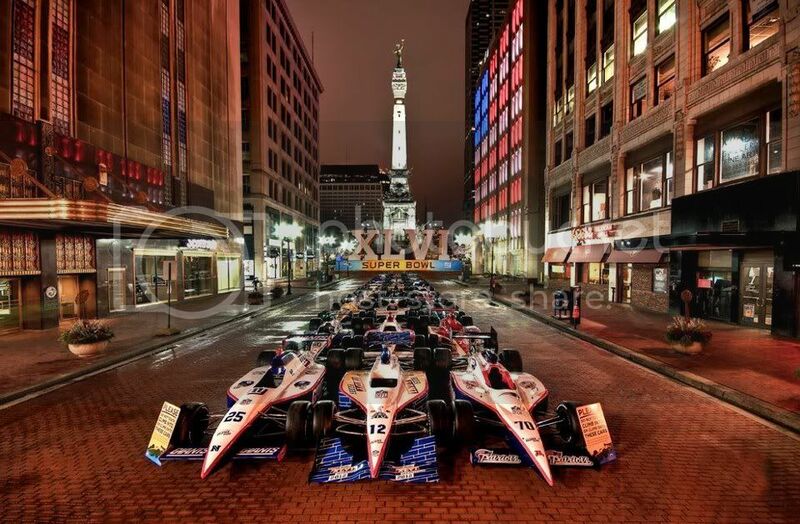 Through the weekend, 33 Indy cars decked out in NFL team colors and logos were lined up on Meridian Street. This week, they'll be sent out to locations throughout the city and beyond, though the Giants and P------- and the Super Bowl car will stay downtown. 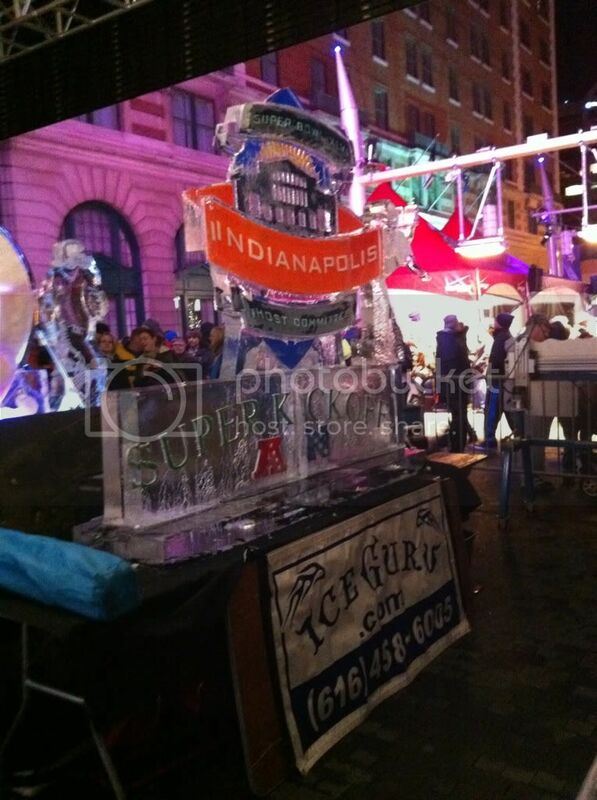 It was a great way to tie together what Indy is most famous for -- the Indianapolis 500 -- with Super Bowl XLVI. This awesome pic was taken by Jason Lavengood. Iconic! Click the photo to go to his website. We walked to Georgia Street which is block after block of celebration. Fire and Ice Lounges give people a place to grab something to drink and warm up. Free concert stages with local and national acts keep the music going all night long. Tonight the headliners are the Village People! 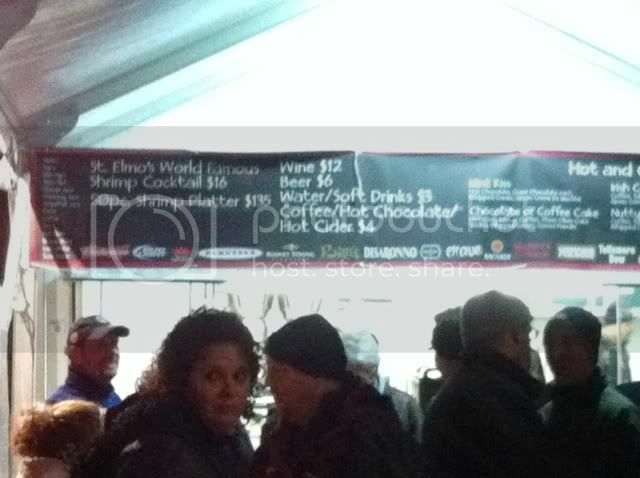 Food carts and trucks and local restaurants are ready to feed hungry fans. You could even walk up to get some famous St. Elmo's Steakhouse shrimp cocktail for $16 or a 50-piece platter of shrimp for $135! There were super volunteers all over the place. You could tell who they were by their blue and white hand-knit scarves. The Super Scarf project netted 8,000 scarves all knit and donated by volunteers around the country. My friend Kathi's came from a woman in California. The note with it said "I made this is May, so when you're wearing it, think of the warm May weather in California." Some of the volunteers were armed with iPads to answer any questions that might come up. Others were oh-so-hard to miss because they were sporting big ? flags on their backs. Somehow I missed the volunteer sign up opportunities. I really must pay more attention to the world around me. There were ice sculptures made by some TLC show ice carvers, too. I didn't even see it all. We turned off Georgia Street to get a bite to eat before we got to the zipline, so I want to go back to see that. We didn't stop in The Huddle at the old Nordstrom which is set up with bars and dance clubs and Super Bowl merchandise. Remarkably, we saw very few drunk people and I didn't encounter anyone who was rude or difficult to deal with, although I'm sure they were there. As we walked through it all, I just couldn't help but be so proud of Indianapolis for putting on such an amazing show. Mike and Charlie went on Sunday to the NFL Experience, which was pretty pricey to get in. They said it was crazy crowded, but Charlie got to participate in a football clinic put on by a Colts player and a Vikings player. He caught two touchdown passes. Not that I'm proud or anything! The best part of the Super Bowl Village festivities was that it didn't feel like a celebration for just two teams. And it wasn't about the Colts (who are swirling in their own transitional drama right now). It was just a celebration for whomever wanted to celebrate. I'm sure as the week goes on and the East Coasters arrive, it will feel more about the Giants vs. the P-------. But for now, it's just plain old fun! Brad is very proud to have lived there. Thanks for sharing the great pics, and GO GIANTS! Love being downtown. We are going back down sans kids on Wednesday for some celebrity sighting--hopefully. The second image in this post of the Super Cars at Monument Circle is copyrighted - Jason Lavengood - www.lavengoodcommercial.com and cannot be used with out consent. Please add the image credit to the image or remove immediately. This image is in negotiations for licensing and cannot be used without credit. Thank you. @Jason -- Oh thanks. I should have thought to look for a photo credit. I'll add it and link to your site. Hope that's ok. It's really a great pic. Fantastic!! Love it!! Wish I were there!! sounds like fun and a one time experience!!! Amy, Thanks for adding the credit. Sorry to be a jerk about it. I've just been instructed to make sure it's credited right now :) Take care! Go GIANTS!